Tubastrea micracantha (Dana 1849), Black Sun Coral. External flesh (coenesteum) green to brown to blackish in color. Colonies are often tree-like, up to a meter in height. Also exceptional for the genus, T. micrantha is a poor captive survivor. Consummate with its feeding habits are good current, filtration to remove foods, wastes. Generally found in areas of good current. At right in an aquarium, in Cebu (P.I.). 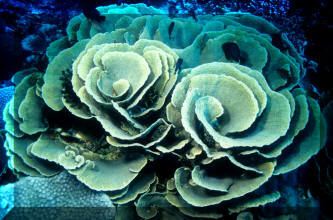 Below in the Red Sea in ten feet of water and growing on the end of a Whip Coral, and N. Sulawesi close-up. Genus Turbinaria Oken : Form large colonies with mainly laminar growth forms, common with several species. 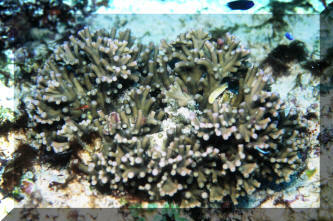 Round corallites which are immersed to tubular in appearance. A commonly offered and kept aquarium genus, whose members prove hardy amongst a wide range of conditions. Being hermatypic and sponsors of symbiotic algae, they do best in medium to bright (25k-50k lux) light and brisk water movement. The thinner, more laminar species and individuals (growth dependent on conditions...) are harder to keep than the more fusiform members of the genus. Turbinaria frondens (Dana 1846), family Dendrophylliidae is a newly popular, hardy stony coral for reef tanks with good lighting and water quality. Frond-like plates with excise cylindrical corallites. A spectacularly colored specimen here (most are green to brown) in my friend Maurice Bullock's main reef. Turbinaria mesenterina (Lamarck 1816). Pagoda Coral to hobbyists, Bowl, Cup, Lettuce, Scroll Coral to the trade. Indo-Pacific, Red Sea to Polynesia. 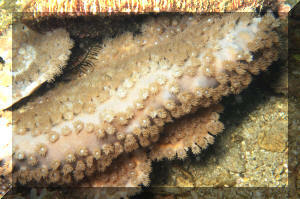 Colonies laminar, more convoluted in shallow waters to upright in deeper water (see below). Corallites crowded, about 2.5 mm across, stick out further than similar T. reniformis. First two images, Fiji, next two Cebu, Philippines, bottommost N. Sulawesi. Turbinaria patula Dana 1846. Colonies are generally irregularly folded, upright, one-faced fronds. 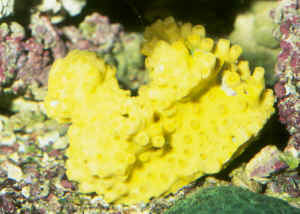 Corallites of about 5mm diameter with elliptical, leaning-over openings. Aquarium image.